Need security screens and Security doors around your house? We have a variety of screens to suit your budget. We can do a fantastic package deal on your glass sliding doors and windows. We manufacture all our screens and doors to fit first time every time. SecureView highly evolved security screens set the standard in technical perfection. With effortless strength and versatility, SecureView works smarter to deliver an impeccably stylish solution to your commercial project. Every SecureView product is custom crafted by expert technicians to suit your specific design or environment. SecureView’s innovative design and superior strength is unsurpassed in the market. Our commitment to using only the finest materials in its construction, combined with the use of advanced adhesive technology, make SecureView the smart choice for commercial and residential applications alike. SecureView consistently surpasses these standards. SecureView selects T316 marine grade stainless steel mesh over its inferior T304 commercial grade counterpart. T316 has a higher MPA strength of 940, which means a stronger wire more closely woven to deliver optimum strength, ventilation and insect exclusion. The open area on SecureView mesh is measured at 42.71% with an aperture of 1.575mm, as opposed to 1.710mm used in T304 mesh. SecureView’s T316 marine grade stainless steel mesh is better suited to the Australian exterior environment, particularly in coastal regions, due to its resistance to corrosion. Our most recent Australian Standards tests were independently performed by scientists from Curtin University in Western Australia, AZUMA Design & Testing in Sydney and ASSA ABLOY in Brisbane. In all cases, SecureView security doors and window screens passed all AS tests with flying colours. The Impact Test is designed to simulate a physical attack on a screen. To perform this test, a large pendulum weight is used to generate 100j of impact energy at a specified point. In order to pass this AS test, the door or window screen must withstand a series of five impacts. The Jemmy Test involves wedging a lever between the security door lock and hinge and the door frame to which the security screen is mounted. A mechanical winch is used in an attempt to pry the door open. In order to pass the Jemmy Test, the security door must remain securely closed. SecureView’s security doors and windows passed this AS test with ease. 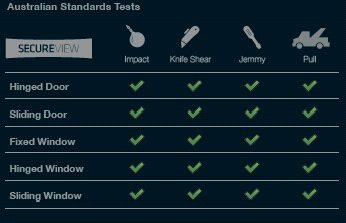 When testing type 3 products, such as SecureView, a pull test can only be carried out if a sufficient gap is achieved following the Jemmy Test. If no gap is formed, there is nowhere to mount the Pull Test bracket, or hold onto in a real scenario. Because SecureView products performed so well in each preceding test, the Pull Test could not be carried out and SecureView’s security doors and windows automatically passed. Southern Cross Glass Windows and Doors supply and install only the best when it comes to yours and your family’s safety and security our 7mm Diamond Grille range. Security Doors play a major part in your families home as it allows access to the front of the property and entertaining areas, allowing air flow throughout the house without compromising your safety and security. Product strength and performance are key factors in deciding which security doors to purchase. Our 7mm Diamond Grille Doors are manufactured in house and are custom made to suit your home. Hinged security doors are often your first line of defence at home. Most homes incorporate hinged doors as part of the front entry and all our 7mm diamond Grille Hinged Security Doors are custom made to measure guaranteeing perfect fit to all types of doors. Sliding and stacking Security Doors are growing more popular in today’s new and renovated homes. Many homes incorporate one or more sliding doors as access to entertainment areas, back yards and patios. In the past it has been difficult to add security doors that do not detract from the views or obscure vision. With Security sliding doors installed you can allow air flow throughout your rooms while still feeling safe and secure. All our security screens are custom made to suit your specific window frame. We fasten our window Security Screens into your window and together combining for proven strength and durability of the 7mm Security Grille. 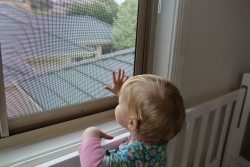 Your family now has a security window screen that looks great whilst providing excellent security.